Step aside, Iggy Azalea! Jimmy Fallon took on the Australian rapper's mega-hit single "Fancy," and gave her a major run for her money. The funny man, 39, has taken to impersonating Neil Young over the years, and he tried on the folk-rock musician's persona again for the Tonight Show performance on Wednesday evening, July 7. Donning a wide-brimmed hat and strumming at a guitar, Fallon put an alternative spin on "Fancy," which has been No. 1 on the Billboard Hot 100 for six weeks. 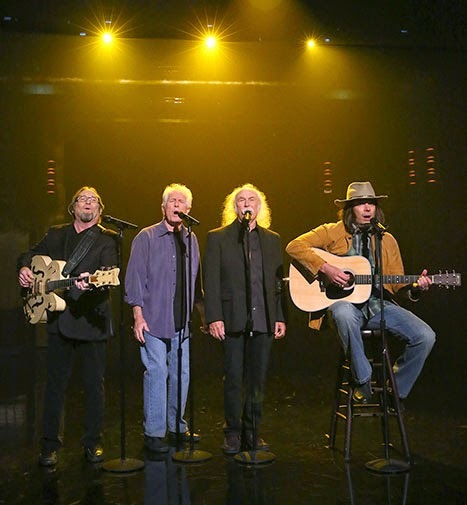 Already impressing with his soulful rendition, Fallon's performance was then taken up a notch when he was joined by the real Neil Young's longtime collaborators, David Crosby, Stephen Stills, and Graham Nash, of Crosby, Stills & Nash. After Fallon gave a smooth harmonica solo, the celebrated musicians lent their vocals to the track, crooning, "I'm so fancy, you already know / I'm in the fast lane / from L.A. to Tokyo." In the past, Fallon as Young has been joined by other big-name artists, including Bruce Springsteen and Jack White. As for "Fancy," he memorably lip-synched the track back in April during a hilarious battle with Emma Stone.